Buffalo: July Fourth Celebration in the Erie Canal Harbor Central Wharf. 6 p.m. to midnight. Fireworks at dusk. Lewiston: Fireworks at dusk, Lewiston Plateau, near Artpark. Can be seen from Academy Park on Center Street. Rain date: Tuesday. Lockport: Fireworks at dusk at Outwater Park, off Glenwood Avenue and Trowbridge Street. 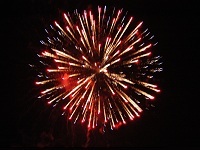 For a full list of fireworks and festivals, check out the Buffalo News.